The video is typical of apologetics in the scriptural sleight-of-hand it offers. First, most conservative apologists suggest that all we need is Scripture to understand God, Jesus, and Christianity -- the Protestant sola Scriptura, taken to a sometimes-absurd extreme. Yet note what this "explanation" does: it cites the fourth-century church historian Eusebius to make sense of the discrepancy, thereby conceding the fact that Scripture alone does not answer this question. Eusebius (Ecclesiastical History 1.7.1-12) is actually quoting here a letter he read from an Africanus to Aristides, which posits that in Jewish law if a man dies childless his brother would take charge of his son. Therefore Jacob "begat" Joseph (Matthew) but Joseph was also the "son of" Heli (Luke) his uncle (the translator of the Loeb's Ecclesiastical History, Kirsopp Lake, calls this an "obscure argument"). This is why, we are led to believe, Matthew used the word "begat" but Luke only used the phrase "the son of." Of course, this is a specious argument already for a number of reasons. First, that distinction is not specific to this instance (the parentage of Joseph), but runs throughout the two genealogies. In point of fact, Luke doesn't really say "the son of," but rather just "of," since he lists a line of men in the genitive case, implying that each is the father of the previously listed man in the same way that Joseph was the father of Jesus (and even here, Luke says Joseph was "thought to be" the father of Jesus). Thus Luke traces the genealogy from Jesus, "son of Joseph" back to Adam, by way of sons. 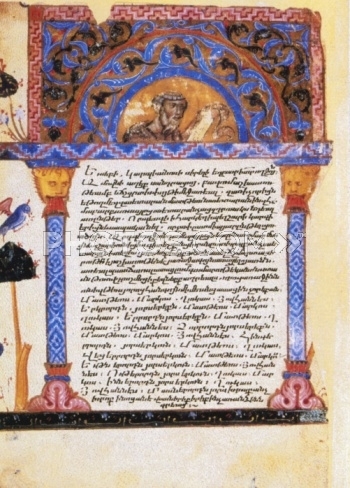 Matthew in contrast starts with Abraham and uses the "begat" format (ἐγέννησεν), instead tracing the lineage by way of the fathers. So the notion that Luke is specifically avoiding using the term "begat" here is dishonest, for he uses it nowhere else in his genealogy. It's a completely irrelevant point, meant only to wow those who don't in fact know their Bibles very well, and treating it as though it means something is a false witness of the first degree. οὐδὲ μὴν ἀναπόδεικτον ἢ ἐσχεδιασμένονἐστὶν τοῦτο. τοῦ γοῦν σωτῆρος οἱ κατὰ σάρκα συγγενεῖς, εἴτ' οὖν φανητιῶντες εἴθ' ἁπλῶς ἐκδιδάσκοντες, πάντως δὲ ἀληθεύοντες, παρέδοσαν καὶ ταῦτα. (H.E. 1.7.10-11). "This is not an unproven or offhand thing. But those relatives of the savior according to the flesh, either because of honor or to instruct also, being wholly truthful, handed down these things." If you think Eusebius sounds like he is perhaps protesting too much, you are not alone. This bit is after Africanus' letter, and Eusebius does not cite where he gets this information, 300-400 years after the fact. The entire explanation defies critical analysis, and is convincing only if one already subscribes to Biblical inerrancy and so firmly believes there must be some reconciliation of the text available. To believe this video's rationalization, we have to assume that a fourth-century CE Greek historian is accurately recording the intricate family details of a first-century BCE Jewish peasant, and that said first-century BCE Jewish peasant's family accurately and to the letter followed the prescripts in a seventh-to-sixth century BCE text (Deuteronomy). Even then, we're left with the problem that said "brothers" have different fathers in each genealogy, so we again rely upon the fourth-century CE historian's obscure rationalization for how it came about, again with nothing but his insistence as to its accuracy. Is all of that more likely than the fact that here (as well as elsewhere) the authors of Luke and Matthew simply do not agree? Not hardly. I do not think that anyone proposing a traditional or orthodox reading of Scripture is automatically practicing apologetics. But for many denominations, such as the Southern Baptist Convention, apologetics is a key part of their ministry. Indeed, its institutions even offer degrees in apologetics. And in those cases, it most often comes down to defending biblical inerrancy and literalism (which routinely conflict). Like the example of the video above, most apologetic arguments of this stripe are inherently anti-intellectual and dishonest. They ask you to make a host of assumptions, suspend all critical thinking, isolate words and phrases from their context (like "son of" and "begat" above), and operate under the working assumption that the Bible must be wholly, internally consistent, an approach we would take with no other set of texts. They also encourage an environment in which questions are not welcomed, except for the purposes of laying them to rest with a readily available explanation. That is not respecting the Bible, despite its proponents asserting that anyone who does not practice such chicanery has a "low view of Scripture." The "low view of Scripture" is one that robs each individual part of the Bible of its individual voice in order to service the untenable ideology of biblical inerrancy. Don, this is clear and brilliant. Thank you for spelling it out! What you have failed to mention is that there is a spectrum of views, going from plenary inerrancy, through infallibility, inspiration, and finally, down to demoting it to a purely historical human text. Sounds like you're in the last category, which may honor 'reason,' but not the scriptures themselves. The 'purely fallible human document view' most certainly can be described as a 'low' view, even if inerrancy may be seen as beyond a high view to a heretical view. Of course there's a spectrum of views. As I said, I don't consider anyone arguing from a conservative or orthodox point of view to be therefore engaging in apologetics; by the same token, I don't consider anyone with a view of inspiration (which most denominations have in some form or another) to be parroting inerrancy. Whether it's a "purely human text" has of course nothing to do with inerrancy per se, and I've made no such argument here, whatever your inference may be. You yourself may not be promoting an inerrancy view, but I think these sorts of false dichotomies (recognizing inconsistencies thereby means it's a "purely human document" and therefore is a "low view of scripture"; one has to either "honor reason" or the scriptures themselves) service the inerrancy viewpoint, as they seek to neatly paper over complexity in favor of a clash of only two viewpoints. Yes. Two clashing viewpoints often find the victor standing silently aside, watching those who enjoy being 'adversarial' ruining both each other and themselves in the process. (and sadly driving others away from the bloody and unnecessary battle, over 'non issues' like politicians vying for public cheers.) True victory is sometimes ignored. I find the 'spirit-realm' view, or 'supernatural view' to be the preferred one. I would rather become effective with family and children in my life than 'hold inside information that wins debate'. It seems foolish to 'rattle the sabres' of 'inerrancy'! or 'human document'! in the arena of issues concerning documents and 'inconsistencies' in light of the 'powers' that seem to stand around 'the book'. I was 'robbed' by the 'bible teachers' of my youth; who were either lazy, prideful, adversarial spirited, or who treated the scriptures with the same tone as 'fairy tales'. A teacher who Cares more about 'being right', proving personal thesis, or winning a debate, is a treacherous person. Refusing to 'get a broad picture', or refusing to take a reasonable glimpse of truly 'supernatural activity' around 'the writings' can raise a camp of folks who say 'yeah thats right!' who lack discernment. I am human enough. I know too well the danger in a stance of 'intellect'. The Spirit yhvh who is called 'God' consistently likes to 'offend the mind' and 'smash the human agenda' to see where the 'hearts of humans' go, amidst the 'offense'. The priest and the levite passed the bleeding man because of their 'agenda'. Thank you for all your work. May your efforts bring the highest success, and may refreshment from the HolySpirit just pervade all your days, all your associates and all your assets too!! I dont know what you would suggest to Sasquatch, Brother Burrows, i offer these things that gave some joy and rest to my busy life. 'Searching' on some of these topics produces some nice 'studies that i wish i had gotten as an 8 year old. Fascinating history of 'the book'. 1)1947-The book is 'discovered'. 1948-The land is given to the 'people of the Book'. Wierd. (did YHVH give them back the 'purest book', then the land?) The strange event of the discovery of the Dead Sea Scrolls precisely one year before the Judah folks are offered the land, by a world 'concerned and touched' by the holocaust. (and i am a pacifist Yeshua follower not a militant or 'temporal Zionist') 2)The strange event of the Septuagint (Greek translation) of the Hebrew Scriptures -for the Alexandria Library by Ptolemy Philadelphus. An Egyptian. Cool. Ironic. Wierd. 250? BCE. The 'rumored miracle' of 70 individual translations being word for word the same, and Philadelphus saying 'This is God' no human could do this. This translation done in just enough time to distribute the 'Hebrew Scriptures' in the 'business language' of the world on all the trade routes before Yeshua shows up. Nice. The Greek speaking peoples can look at the writings and say to the Yehudim.. Hey! This guy is the 'supernatural one' predicted in 'YOUR' writings and also predicted by the Sibylline prophetesses! Your 'Messiah/supernaturally empowered one/anointed one'. THATS cool. 3) The spectacular set of 2-300 individual predictive points set in the Hebrew Scriptures that seem to just make a 'connect the dots picture' of the .."accounts".. of the life of Yeshua of Natsaret. 5)Just the wonder of YHVH around courageous Wycliffe! His 'illegal English bibles' bought and destroyed by 'the enemy/the crown'. That money provided his group in France with enough money to make a truly ENORMOUS 'press run' much greater than the 'destroyed ones' which was then sneaked in to England in many creative ways. These, and many more fascinating 'WIERDNESSES' are clearly 'indicators' about 'the presence' around 'the book' The presence of intense 'spirit realm' activity. This causes me to think hey, there is a 'force field' or 'presence' or 'Spirit-person' messing with these writings. This causes me to be convinced that there can be apparent inconsistencies 'designed' into the writings as 'stumbling blocks' to human intellect, by 'spirit'. 'The spirit of Lovingkindness has used lumpy-bumpy humans to record this stuff, and the 'apparent FLAWS' in the writings may actually be there to cause 'erudite intellectals' like myself to 'remain adversarial' to the truth. Giving me a better chance to 'justify' shoving aside the parts that 'trouble me' and so that i do not 'Get it' until i am suffering, seeking, 'calling out in humility to Rescuing Spirit (yeshua)! ps..spent some time hauling boats. Oh wow - Don, your response to danielg was EXCELLENT. You have a very precise and incisive mind and set of arguments. Thanks Soren! Yes, this is my blog, such as it is. I don't get around to writing as often as I'd like, as I'm in the midst of trying to finish my dissertation, but I enjoy the outlet that it offers me. Thanks for your kind words! Stehen- thank you for this response, which I enjoyed reading as much as the original post. It is both comical and maddening to watch as we humans seek to make sense of scripture while ignoring the supernatural work of the Holy Spirit which is weaved throughout, he resurrection being only one. Thank you for this post. A breath of fresh air. It simultaneously renewed my appreciation for my seminary studies and my love of early church history. I do believe the video posted in this blog to be a compelling argument for explaining the discrepancies between these genealogies. Your complaint that it is “scriptural sleight-of-hand,” however, is not very compelling. You stated, “it cites the fourth-century historian Eusebius to make sense of the discrepancy, thereby conceding the fact that Scripture alone does not answer this question.” I find this point to be rather odd, because it sounds like you believe that those of us who hold to inerrancy must believe that the Bible actually explains all of its difficulties/questions within the text. Let me state, flatly, that this is not a belief by those who hold to the inerrancy of Scripture. (Indeed, I don’t know of anyone who holds to inerrancy to actually believe such a thing.) Inerrancy is the view that the Bible does not truly error – not that we can make sense of every question or issue via Scripture. The way to deny or disprove inerrancy is to supply an example of an error in Scripture that has no plausible explanation for it. James McGrath, nor yourself, or the countless atheists I have spoken with have been able to do so. But I digress – more on to your points…You stated, “Luke doesn’t really say 'the son of' but rather just ‘of’.” I’m not sure what point you are trying to make here. The use of the genitive is typical of the Greek language in such a list, thereby “son of” in place of “of” in translation is perfectly appropriate. (This statement adds nothing to your argument, is my point.) You did state, “So the notion that Luke is specifically avoiding using the term 'begat' here is dishonest, for he uses it nowhere else in his genealogy.” Even so, his genealogies extend back to Adam, so he’s obviously not giving the direct line (from father to son) throughout his genealogy. The length of such a genealogy would be incredible. Therefore, he uses this term to show ancestry only, with only some examples of father-son relationship. We see this exact same method in Old Testament genealogies as well (see Gen. 5). This doesn’t take away from the point in the video. Regarding your overall point, should we contend that the genealogies are made up or arbitrarily put together or that both of these authors were giving factual information, even if they didn’t feel the need to explain themselves to a 21st century blogger who would rather find reason to doubt them? Food for thought. Part 1/2: My point about going outside of Scripture was aimed at the doctrine of Sola Scriptura. Are you saying that the Protestant denominations that parrot inerrancy do not hold (anymore) to such a doctrine? If not, great! But I have my doubts. You may find the rationalization given by a fourth-century writer about something that happened almost a half millennium earlier to be “plausible.” Certainly, it is something that “could have” happened, but then, we can say the same about any number of Hollywood scripts. The question is whether that tortured explanation is more likely than the possibility that two writers simply differed – a possibility given all the more weight since they differ so often. Again, the only way you would consider that even equally as probable is if you start from the assumption that the Bible has to be internally consistent. And again, this is an assumption shared by virtually no scholars I’m aware of outside of conservative seminaries. The opposite, in fact – that the Bible is a library of texts written by authors whose agendas and accounts are often in tension, even internally within themselves – is the working assumption in virtually all scholarly treatments of the material. As to the Greek genitive, I was merely being exhaustive, lest I be accused of carelessness when referring to the original text. But the “genitive” case is so called because it usually refers to the origins of things, thus its use in possession and, as you note, in lieu of the explicit “son” often in literary texts. That only strengthens the point that Luke is not being careful here to avoid “begetting” language like the sort Matthew uses, which is the type of sleight-of-hand that the video employs. Rather, anyone reading this would assume that the sons listed were sired by their fathers in the good old-fashioned way, not in the sort of roundabout fashion posited by Eusebius and Africanus. The point of “son of” vs. “begat” in the first place is absurdly irrelevant, so I find your parsing of my comments on it to that score highly ironic. Of course anything I add is likewise irrelevant – the whole discussion is pointless to a fault. You further practice assumptive apologetics when you assert that Luke is “obviously not giving the direct line (from father to son) throughout his genealogy” when he traces it from Adam, since the “length of such a genealogy would be incredible.” Does Luke say this is an abbreviated genealogy? Why is he “obviously” not giving the line from Adam? The only reason you suggest that is, again, because you enter the text with the assumption that it must be squared with modern understandings of generational ages and whatnot, that it must somehow represent a “factual” account based on what we know now. Talk about reading through a 21st century lens! Part 2/2: Regarding your “food for thought,” namely, “Should we contend that the genealogies are made up or arbitrarily put together or that both of these authors were giving factual information, even if they didn’t feel the need to explain themselves to a 21st century blogger who would rather find reason to doubt them?” These are not merely the questions of a 21st century blogger; these questions have been around for as long as Christianity. Even Mark appears to have a bone to pick with the Davidic lineage. It is possible they were made up or arbitrarily put together to proof-text Jesus’ Davidic ancestry. It’s also possible that the authors thought they were conveying “factual information,” as you put it, terminology that is a bit more nuanced in antiquity than when it’s used by many apologists, who are so eager to defend the gospels against rationalist inquiries that they require the authors of the Bible to be proto-rationalist historians when such a thing had not fully developed yet. In short, if you want so very badly for the Bible to be internally consistent, then you will, of course, subscribe to any number of gross improbabilities and cling instead to the bare whisper that it’s “possible.” But that’s not honest scholarship, which is why I term it intellectual dishonesty. As a postscript, I apologize for calling you a “trolling” apologist. But let’s be reasonable: you were trolling the page – that’s the 21st century term for it. I intended no pejorative about your looks, demeanor, or alleged residence under bridges. I wasn't trolling the page by the way. Someone I know "shared" the post, which is how I came across that particular Facebook page, and the rest is history. I also need to respond to this comment: "They also encourage an environment in which questions are not welcomed, except for the purposes of laying them to rest with a readily available explanation." As a Christian apologist, I can confidently claim that my colleagues and I deal with more literature (books, articles, blogs, etc) that have an anti-Christian, atheist, and/or low view of Scripture bias than most Christians know exist. We regularly deal with contrary viewpoints, misguided skepticism, and thoughtful questions. After all, it is our job and calling. In short, this comment is terribly misguided and incorrect. "Misguided skepticism." I rest my case. In apologetics, no skepticism is legitimate, as it is only grappled with so as to be disposed with by way of a handy rationalization. Sola Scriptura does not mean, “The Bible will explain in detail if the days of creation should be taken as 24-hour days or as periods of time.” Once again, if you think this is what is meant by this doctrine, you have misunderstood. The doctrine means the Bible is authoritative in matters of faith and life and, furthermore, that the Bible alone is divinely inspired by God and He has not (as one example) inspired (or “breathed”) the Book of Mormon. Regarding your point about the Bible being internally consistent, I have simply not been given a good reason to doubt that the Bible in places is making up or supplying incorrect information. Furthermore, if you do believe this about the genealogies, why not also believe that Jesus did not in fact rise from the dead? What arbitrary reason do you have for believing that claim by Matthew and Luke? Because it’s “more important” than the genealogies; therefore, I will choose to believe it but not believe the finer details? Furthermore, the Gospel writers only give us excellent reasons, time and time again, that they are recording things accurately. Google “the undesigned coincidences of the Gospels” for one example. This last part, the house-of-cards/slippery slope argument that if we recognize biblical inconsistencies in one place it means the rest of it is naught, is a favorite of both Christian apologists and polemicists. It's an absurd dichotomy that's equally at the heart of your "Bible is all myths" remark you make below. I've made no such hierarchical argument about the various parts of the Bible. In each instance, I tend to be persuaded by the force of arguments and evidence presented. That's how scholarship is supposed to work. As for Sola Scriptura, I'm aware of the doctrine, how it came about historically, and how it has been applied and re-applied by Protestants since the Reformation. I would simply say that, if we need church fathers from antiquity to help explain Scripture and doctrine, I don't see why we don't stick with the Catholic model, which lends a certain amount of credence to tradition and hierarchy. Saying that, in order to understand how error-free the Bible is we need Sam Dallas and an Apologetics Study Bible does not seem too far afield from saying we need another sacred text, like the Book of Mormon. You stated, "I've made no such hierarchical argument about the various parts of the Bible. In each instance, I tend to be persuaded by the force of arguments and evidence presented. That's how scholarship is supposed to work." But what about the parts of the Bible that cannot be quantified via "arguments and evidence." Such as statements like John 3:16 (or a host of others)? My high view of Scripture is not dogmatic, because I have studied the textual and archaeological evidence of the Bible and have come to believe it to be reliable. After doing so, I came to believe the claims of Christianity to be true, and (most importantly) the resurrection of Jesus. Both of these facts have lead me to be inclined to believe the Bible to be inerrant, illustrated by the following syllogism: 1) God cannot err. 2) The Bible is God's word. 3) Therefore, the Bible cannot err (at least in its original autographs). That being said, this is not a doctrine I hold at the same level as the deity of Jesus (as one example). But for me to believe that my reasoning is incorrect, I would need a "defeater" that I am misguided in my rationale. That has not been supplied. And, as stated before, the evidence is compelling enough that I am not willing to give up my view of inerrancy based on weak arguments or examples (such as discrepancies concerning the number of angels mentioned, etc). You stated, "Saying that, in order to understand how error-free the Bible is we need Sam Dallas and an Apologetics Study Bible does not seem too far afield from saying we need another sacred text, like the Book of Mormon." Um, of course not. A high view of Scripture can definitely help, though. Your initial syllogism: "1) God cannot err. 2) The Bible is God's word. 3) Therefore, the Bible cannot err (at least in its original autographs)," contains a number of problems. "The Bible is God's word" does not describe your full ideology on the matter, as these exchanges illustrate. You believe the Bible to be far more than just "God's word" - you believe it to be plenary and inerrant, a perfect rendering of God's word on earth. Others are perfectly willing to accept that while it is a sacred text, it came through profane hands, and thus can contain errors. The autographs are gone, so they are irrelevant, but that distinction says something: what's in the Bible now are NOT the autographs, so you agree that what we hold in our hands is not inerrant, correct? Not 100 percent inerrant, unless you are willing to say we do, in fact, have the autographs. But if you were willing to say that, you wouldn't have made the distinction. Yet by insisting on rationalizing all points of tension, you treat it as 100 percent inerrant, even though it does not contain autographs. Yes, a "high view of Scripture," as you put it, is the starting point. From there, you are convinced of things no one else is, because it services the previously held ideology. That's why this conversation keeps going in circles: your ideology and scholarship is a circle, as it is for all others. If inerrancy were something logically reached by textual and archaeological evidence, secular and non-Christian and mainline Christian textual critics and archaeologists would be persuaded by it; as it is, they are not, and you are forced to suggest they (the majority) have the ideological agenda and you do not. Again, not persuasive. That “the Bible is a library of texts written by authors whose agendas and accounts are often in tension, even internally within themselves – is the working assumption in virtually all scholarly treatments of the material,” is simply a statement of fact. You can argue that all secular and mainline scholars are wrong and the Southern Baptist Convention (alone) has it all figured out, but again, I find that unlikely. The scholars who make this material their life’s work are not convinced by biblical inerrancy, because it requires too much rationalization and too many assumptions on the front end. We’ve seen a sampling of these sorts of things here. Again, no one who comes to the text would automatically assume there must be some reconciliation between the two unless he comes to the text with that assumption ahead of time. It is an assumption we take with no other set of texts. It is a religious belief, not a scholarly conclusion in the least. The genre of the Gospels is ancient biography; however, it is incorrect to contend that their goal was not to give an accurate account of the life and teachings of Jesus of Nazareth (you seemed to imply this). Luke even states in his prologue, "Inasmuch as many have undertaken to compile an account of the things accomplished among us, just as they were handed down to us by those who from the beginning were eyewitnesses and servants of the word, it seemed fitting for me as well, having investigated everything carefully from the beginning, to write it out for you in consecutive order, most excellent Theophilus; so that you may know the exact truth about the things you have been taught." This is a very strong claim of truth and accuracy by the historian Luke (many biblical scholars are very comfortable calling him an "historian," by the way). You stated, "You can argue that all secular and mainline scholars are wrong and the Southern Baptist Convention (alone) has it all figured out, but again, I find that unlikely. The scholars who make this material their life’s work are not convinced by biblical inerrancy, because it requires too much rationalization and too many assumptions on the front end." You're actually making an understatement. The truth is countless biblical scholars are actually very skeptical of the Bible and many are philosophically opposed to its record of miracles, so I'm fully aware that many don't subscribe to inerrancy. This is not surprising, though. The "doctrine" of inerrancy is, ultimately, a theological DOCTRINE with a foundation in reality (as I've attempted to argue). I fully recognize that (in the end) the claim of inerrancy is a THEOLOGICAL affirmation - but it is not found in a vacuum. Rather, it can argued using the biblical text, reason, and historical evidence. I do ultimately agree with your last statement that the doctrine of inerrancy to be an religious belief, not a scholarly conclusion. (Once again, we're not hiding this - we do call it a "doctrine" after all.) But like my other religious beliefs, I (personally) believe them to be true in the same way I believe that "2+2=4" is true or that "Abraham Lincoln was the 16th U.S. president" is true. I'm glad you have the genre of the Gospels all worked out! All of us classicists and biblical studies scholars can now consider that settled. Even calling them "ancient biography" opens up more questions than answers, since "ancient biographies" do not limit themselves to rationalist facts in the same way as modern biographies (supposedly) do, as you seem to imply. Have you read Lucian's biographies? Here is a man whose drumbeats about truth and falsehood are rivaled by no other in the second century, yet they contain some serious whoppers. Yes, Luke makes a truth claim. Lots of writers in antiquity make truth claims, and to be honest, it's something that raises red flags more so than settles anything. Indeed, many people speculate Luke might have even been writing himself about Mark's gospel when he references other texts, since he clearly uses Mark but, again, makes changes where he thinks they are appropriate. Ergo, Luke himself is "correcting" Mark in places (either his accounts or his omissions) by offering his own account. I'm glad we agree that inerrancy is a doctrine, a starting point, a theological claim. Again, you can claim that it's a "natural" result of your studies, but it's not: it's a doctrine and belief first. Again: if it were a naturally formed hypothesis, more scholars would sign on. It's not. By contrast, mathematicians and historians all agree with your last two points (as far as I'm aware -- perhaps there are some high mathematical theories which undermine this). But you are forced, with this doctrine, to place yourself in contest with scholarly consensus supported by centuries of evidence. So it isn't the same truth claim, except insofar as your "personally" parenthetical is concerned. But we can all "personally" believe whatever we want; it doesn't make it so. You stated, “Even Mark appears to have a bone to pick with the Davidic lineage.” Yes, I saw your post on this. I think that you have GREATLY misinterpreted this passage, so I disagree. Mark, in no way, has a problem with Jesus being a son of David. You stated, “In short, if you want so very badly for the Bible to be internally consistent, then you will, of course, subscribe to any number of gross improbabilities and cling instead to the bare whisper that it’s ‘possible.’ But that’s not honest scholarship, which is why I term it intellectual dishonesty.” It is true, due to how extensive the Bible is clearly providing an accurate history (as proven through the fulfillment of prophecies, the textual evidence, and the archaeological evidence), I will give it the benefit of the doubt in areas that are not as clear. Such evidence has given me a high view of Scripture. Finally, you stated, "’Misguided skepticism.’ I rest my case. In apologetics, no skepticism is legitimate, as it is only grappled with so as to be disposed with by way of a handy rationalization.” Let me give you an example: “The Bible is just a bunch of myths written by some guy in a cave thousands of years ago.” (I’ve heard this one before.) This is a perfect example of "misguided skepticism." And correcting such skepticism is a virtue, in my mind. Of course, those genealogies of the Old Testament you’ve studied would have a different intended audience than the Gospel of Luke, and were written in a different language at a different time (see initial supposition about the Bible as a library, not a book). Luke appears to be directed at Gentiles, though he makes extensive use of Septuagintal phrasing and the like. But to suggest that the Greek-speaking Gentiles of the Roman Empire would have read Luke’s genealogy and thought other than direct lineage is absurd, especially since the entire point of the lineage to begin with is to “prove” that Jesus was descended from David. To suggest that Luke knew that someone other than his man had “begat” Joseph is to all but accuse the Gospel writer of lying. His information or genealogy is simply different than Matthew’s. There does not have to be an explanation. Someone (or both) probably just got it wrong. That’s the most probable. My point about skepticism is this: I agree that excessive skepticism is annoying and absurd. I have written about this before with respect to the so-called “mythicists.” But it’s equally absurd to start with a whole host of assumptions about the text (it’s inerrant!) alongside a host of orthodoxies, and then “study” the text in order to find ways to make it conform to the assumptions you started with. It’s not true scholarship, which (ideally) investigates and goes where the evidence leads. If someone came to you and said, “I just don’t think Jesus was divine. John is really the only Gospel that suggests that, and Mark, the earliest, doesn’t seem to think so at all,” you are not going to shrug and say, “Well, that’s the conclusion a lot of people have come to.” You are not going to let that “skepticism” stand, because it falls outside the accepted parameters of the orthodoxy to which you are devoted. And so, in accordance with your training, you will then set out to explain why this person, and any scholar, or even all scholars, are wrong about a given point and you and your denomination are correct. Thus while questions are welcomed, the only answers that are allowed within said apologetics are those that fall within the narrow parameters of Southern Baptist orthodoxy, or whatever orthodoxy you’re peddling. To then masquerade the entire process as a scholarly one is, I think, completely dishonest, because you have disallowed a huge bulk of answers from the starting gun. This is fun, but it’s already past my bedtime. I’m confident there can be no reconciliation. If you are fervently devoted to biblical inerrancy, all arguments supporting that claim will be self-evident. But that’s just it: you have to be firmly devoted to it for them to carry that much weight. To everyone else, it just seems like sad rationalization. You stated, "I don’t doubt you disagree with me (and countless other scholars) about the puzzling nature of Jesus’ argument against a Davidic Messiah!" I assure that your interpretation places you squarely in the minority (note: fringe) of those who have provided an exegetical interpretation of this passage. The paradox Jesus mentions is intended to expand the messianic "categories" of his audience. He (in no way) denies that the Messiah was a son of David but notes that Psalm 110 implies that the Messiah - though David's son - is SUPERIOR to David. Furthermore, your overall point regarding this passage fails to make sense of Mark 10:47-48, in which the blind man calls Jesus "Son of David" twice, without correction by Jesus in the narrative or editorial correction/dispute by the author Mark. Secondly, your point is further undermined by Mark 11:10, in which during the the so-named "triumphal entry" of Jesus, the people in Jerusalem imply the lineage link between Jesus and David in their worship of him, without correction by Jesus in the narrative or (once again) without editorial correction/dispute by the author Mark. In this passage, Jesus was claiming to be even greater than what "son of David" implies. You stated, "If you have been arguing with people who suggest 'the Bible is just a bunch of myths written by some guy in a cave thousands of years ago,' you have been arguing with idiots, or rank amateurs. I am neither." I, of course, know that you are not. What I meant when I said "I have heard this before" is that I have spoken to skeptics who have made statements like this. This would be an example of "misguided skeptism," which you were disputing the possibility of earlier. That was my point. I was not claiming that you made such a statement or even implied such a thing. You stated, "To suggest that Luke knew that someone other than his man had 'begat' Joseph is to all but accuse the Gospel writer of lying. His information or genealogy is simply different than Matthew’s. There does not have to be an explanation. Someone (or both) probably just got it wrong. That’s the most probable." I feel like you are missing a crucial point here. Who said anything about what Luke "knew" concerning the genealogy of Jesus. It seems perfectly plausible that in his research, this is the line he came up with. After all, he did "carefully investigate" and interviewed perhaps scores of people. This is what he knew. Likewise, Matthew had his sources and we get what we find in Matthew chapter 1. The point of the video is to give what Eusebius claims to be an explanation of how they can both be right (and he, of course, claim his explanation is the correct one). It seems odd to be philosophically opposed to both authors being right, given the fact that you've been provided (at the very least) a "way" in which both can be right. It's fine for you not to agree with Eusebius, but it remains puzzling why his explanation should not remove at least your philosophical opposition to the possibility, even if you find it implausible from an historical standpoint. You stated, "If someone came to you and said, 'I just don’t think Jesus was divine. John is really the only Gospel that suggests that, and Mark, the earliest, doesn’t seem to think so at all,' you are not going to shrug and say, 'Well, that’s the conclusion a lot of people have come to.' You are not going to let that 'skepticism; stand, because it falls outside the accepted parameters of the orthodoxy to which you are devoted." You said, "Thus while questions are welcomed, the only answers that are allowed within said apologetics are those that fall within the narrow parameters of Southern Baptist orthodoxy, or whatever orthodoxy you’re peddling. To then masquerade the entire process as a scholarly one is, I think, completely dishonest, because you have disallowed a huge bulk of answers from the starting gun." My response: Your assumptions are as sound here as your comment that we apologists "encourage an environment in which questions are not welcomed." Respectfully, apologetics is clearly a world that you do not comprehend well. Your level of disrespect concerning our efforts has been heard loud and clear, though. Well, my interpretation of Mark 12:35-37 was that it was puzzling. If you are suggesting that it is not, and that it is scholarly consensus that it is plain and obvious and clear and manifest that Jesus is saying what you are saying, I would love to see some citations to that score, as opposed to simply your assurances, which, your ending protestations to the contrary here, are becoming exceedingly condescending. As it is, however, the Study Bible published in conjunction with THE umbrella organization for biblical studies, the Society of Biblical Literature (this would be the HarperCollins Study Bible) came to the conclusion that this is "mistifying" when its editors agreed on a final draft, and they are certainly not alone. But yet again, you claim that to say this is puzzling "fails" to "make sense" of the earlier references to Jesus as David's son. And again, I say that you are approaching the text with the assumption that it has to "make sense" internally and consistently, and so you see this as a failing. Others do not; they are comfortable saying that, for whatever reason, this passage seems to argue against a Davidic messiah. Why? Who knows. "It seems odd to be philosophically opposed to both authors being right, given the fact that you've been provided (at the very least) a "way" in which both can be right." No offense, but this reminds me of the scene in Dumb and Dumber (I know, worst movie ever), when Jim Carrey wrests from the girl that he has a "one in a million" chance and responds: "So you're telling me there's a chance? Yeah!" (http://www.youtube.com/watch?v=KX5jNnDMfxA) I'm not philosophically opposed to both authors being right, but you have to be convinced that they must be to find Eusebius' explanation (especially the last, unsourced part, where he says that Joseph's uncle and father were "half-brothers" with different fathers) tortured and unlikely. It's not a philosophical opposition. It's about probability. It's far more probable that one or both of them are simply wrong. Since I'm not desperately searching for a "way" in which they must be reconciled, I prefer to stick with the probabilities. Is there a one-in-a-million chance that he's right? Yes, but I don't see that as a reason to cheer and start making wedding plans. I'm quite confidant that you have arguments all worked out for our imaginary interlocutor. I would prefer to see actual, peer-reviewed scholarship than links to your blog, however, and scholarship has long been skeptical about Mark's claims of divinity for Jesus. This is a whole other issue I don't really feel like wrangling over, but I'm going to go ahead and assume that, here too, you would suggest that all other scholars are wrong and the conservative ones know what they're talking about. You're right. I don't have a lot of respect for apologetics. If it makes you feel better, I don't have a lot of respect for polemicists, either, for the same reason: I don't respect a process that starts with a conclusion. Sam, I appreciate your effort, but nothing you are saying here is convincing. You are basing your life's work on a hypothesis that is extremely unlikely to be accurate. It simply isn't - based on all of the reasoning Don has shared, based on all scholarly inquiry I have ever encountered, based on every once of logic and reason with which God blessed us. What you sound like is someone who is trying to justify his every existence. I, for one, am grateful for your work if only for the fact that it inspires the eloquent responses of Mr. Burrows and the like, so that those of us who are not Biblical scholars have the kind of information that helps explain why we believe as we do. That the Bible is not, in fact, inerrant. That makes it no less valuable; actually, I believe it adds great depth to the meaning of its books. Thanks for your kind words, Mindy! After all, the last thing we want is to be dogmatic with our religious views. I agree. All sorts of readings are encouraged. But one thing I've learned in graduate school is to first check the binding; if the book is published by a private publishing house whose aim is "a vision for building up the body of Christ," it may be a worthwhile read, even a scholarly read, but it likely has an agenda to start with. Rather, I would encourage people to read any number of works published by academic presses that are peer-reviewed and refereed by other scholars. They always have points of disagreement, so it's not a place to get definitive answers, but then, that's what so wonderful about genuine scholarship: all the questions. Sam, we're done here. I wish you all the best, despite our disagreements. Many of my family members share your convictions, and I love them dearly. If you have more points you wish to make about inerrancy, I see you have your own blog on which to publish them.